The Thursday Interview: Tim Taylor. 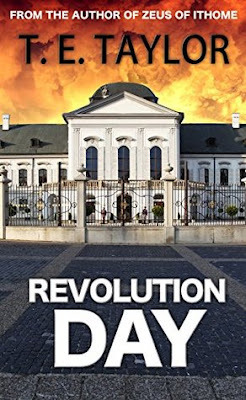 Today, I'd like to welcome Tim Taylor, author of “Revolution Day” to The Thursday Interview. Before we get started, a quick intro! Tim was born in 1960 in Stoke-on-Trent. He studied Classics at Pembroke College, Oxford (and later Philosophy at Birkbeck, University of London). After a couple of years playing in a rock band, he joined the Civil Service, eventually leaving in 2011 to spend more time writing. Tim now lives in Yorkshire with his wife and daughter and divides his time between creative writing, academic research and part-time teaching and other work for Leeds and Huddersfield Universities. Tim’s first novel, Zeus of Ithome, a historical novel about the struggle of the ancient Messenians to free themselves from Sparta, was published by Crooked Cat in November 2013; his second, Revolution Day in June 2015. Tim also writes poetry and the occasional short story, plays guitar, and likes to walk up hills. OK - HERE WE GO !! No.1 Would you break the law to save a loved one? .. why? Yes, of course, but it would depend on what the law was. Would I park on a double yellow line to get my daughter into A&E? Absolutely! Would I kidnap the children of a doctor to blackmail them into granting my mother a drug that she has been refused? No. The mere fact that something is against the law has some moral force, but nowhere near enough to overcome the moral imperative to save someone’s life (let alone the life of a loved one). But many things are illegal because they are morally abhorrent: it is because they are morally abhorrent, not because they are illegal, that I wouldn’t do them. No.2 What is the difference between being alive and truly living? Being alive, in the literal sense, is a mere biological state – even a person in a permanent vegetative state is alive in that sense. Truly living means having a life that is worth living – one we find rewarding or meaningful in some way. No.3 What motivates you to write? I have an overactive imagination, and writing things down is the best way to stop them running around endlessly in my head! And there is something very satisfying about constructing a nice piece of writing – even more so when other people appreciate it! No.4 Why do humans want children? Different people in different circumstances want them for different reasons. Some because they want to be looked after in their old age; others because they want their family line, name or business to carry on. Some people have children because they like children and believe they will find the process of bringing up a child and seeing it grow up rewarding (certainly, I have found it so). Sadly, some people don’t really want children at all but end up having them anyway. No.5 What was the biggest challenge in creating your book "Revolution Day" ? Revolution Day (Crooked Cat 2015) chronicles a year in the life of an ageing (fictional) Latin American dictator, Carlos Almanzor, as his vice-President, Manuel, plots to overthrow him. From the outset I wanted the book not only to tell the story of the plot itself, but also to help the reader understand how Carlos became the man he is. The challenge I faced was how to do this without cluttering up the narrative with great lumps of back story. My solution was to introduce Carlos’s estranged wife Juanita, who has been under house arrest for sixteen years. She is writing a memoir of Carlos’ regime and their marriage, in which she recalls his rise to power and how, once an idealist, he came to embrace autocracy and repression, precipitating the disastrous personal and political split between them. In time Juanita will find herself an unwitting participant in Manuel’s plans and her memoir becomes an integral part of the real-time narrative. No.6 What is the most important thing you have learned in life so far? The realisation that personal fulfilment, family and friends are more important than money and status. I had a high pressure job that was quite well-paid but left me little time at home and was very stressful. When an opportunity came to get out I took it, and have no regrets. No.7 How did you come up with the title "Revolution Day" ? It came very easily. The first scene that came to me (what is now the opening scene of the novel) was my ageing dictator giving a speech from the balcony of his palace during the annual celebration of the revolution that brought him to power. And there was my title, straight away! No.8 How do you handle personal criticism? It depends on what sort of criticism it is: if it is honest, considered and constructive I accept it, reflect on it and try to learn from it. If I think it is ill-judged or unfair I will try to respond to it calmly and reasonably. If it is malicious I am more likely to get angry or upset! No.9 Why should people read your book? I hope that people will enjoy it on more than one level. It’s a political and psychological thriller, with its fair share of intrigue, manipulation, blackmail, assassination attempts, etc; and an ending that will surprise you. It’s also an exploration of the effects of power on those who wield it, those who covet it, and the people around them. The different ways in which it can corrupts people, and also the loneliness, self-delusion and paranoia that come along with it. No.10 Why is there something rather than nothing? I don’t think this question can ever receive a satisfactory answer other than ‘it just turned out that way’. Any explanation of why it turned out that there is something rather than nothing must surely have some starting point (unless you believe it is logically necessary that something should exist, which I don’t). But that starting point – be it a deity, or some metaphysical ‘first cause’ – is already something rather than nothing, and therefore the explanation presupposes what it is supposed to explain. Another way of looking at it is that if there were nothing rather than something, there would be no one to ask the question and no one to answer it. So the question can only be asked if there is something rather than nothing. & the best of luck with your new book! Carlos Almanzor has been the ruler of his country for 37 years. Now in his seventies, he is feeling his age and seeing enemies around every corner. And with good reason: his Vice-President, Manuel Jimenez, though outwardly loyal, is burning with frustration at his subordinate position. Meanwhile, Carlos’ estranged and imprisoned wife Juanita recalls the revolution that brought him to power and how, once a liberal idealist, he changed over time into an autocrat and embraced repression as the means of sustaining his position. In time, as Manuel makes his own bid for power, Juanita will find herself an unwitting participant in his plans. 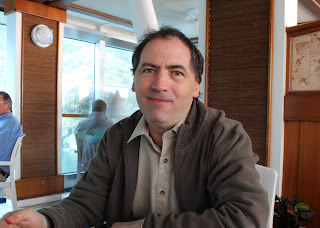 Kerry Alan Denney, author of "Soulsnatcher"
@TheDrunkenDruid Copyright Protected . Watermark theme. Powered by Blogger.